Trogir is about 38 miles (61km) from Sibenik and only 17 miles (27km) from Split, and has a population of just over 10,000. 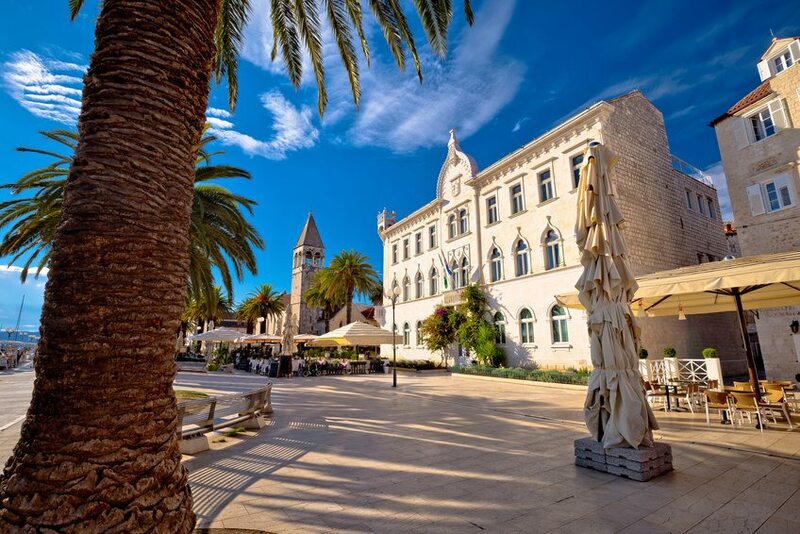 Trogir was designated a UNESCO World Heritage site in 1997 and is home to a number of fascinating historic sights, the best of which is the Cathedral of St Lawrence. 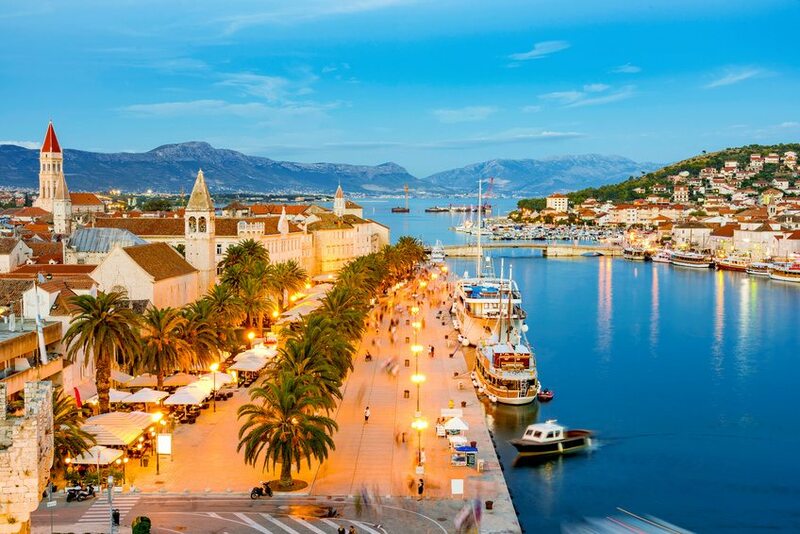 Its proximity to Split Airport also means that Trogir is very easy to reach. As mentioned, the nearest airport is Split Airport – the town is, in fact, only 3km from the airport. There is actually a direct bus from the airport to Trogir Bus Station – local bus line 37 – which stops on the road outside the airport (i.e. not outside the terminal building); journey time is 10 minutes. As the town is so close to the airport, you might also consider getting a taxi. For details of which airlines fly to Split Airport, please see our Getting to Split page. Although findings in the local area suggest that there must have been settlements at the site of Trogir in prehistoric times, the town’s history really starts with a Greek settlement in the 3rd century BC. Greeks from the island of Vis founded the settlement Tragurion, which then went on to become part of the Roman Empire which was expanding through Dalmatia at that time. Trogir came under Hungarian and Croatian rule over the next few centuries, including the rule of Croatian-Hungarian King Bela IV in 1242. In 1420, again as with much of Dalmatia, it became part of the Venetian Empire, until the Empire’s fall in 1797. Trogir then became part of the Austrian Empire (with brief occupation by the French in the early years of the 19th century). After World War I, Trogir was part of Kingdom of Serbs, Croats and Slovenes (which became Yugoslavia), although was occupied by Italy during World War II. In 1991, the town was part of Croatia when it declared its independence. Trogir’s best sight is the Cathedral of St Lawrence (Katedrala sv. Lovrijenac) on which building work started in 1213 on a site where a previous cathedral once stood; the main part of the cathedral was completed in 1250. The cathedral’s bell tower was built between the 14th and 16th centuries, and can be climbed to see fantastic views from the top. A must see within the cathedral is the Chapel of St John, built in 1468, and which is considered the best Renaissance sight in Dalmatia. Part of the city walls, built between the 13th and 14th centuries, are visible today on the southern side of the city. In the middle of the city wall is the city gate, which was built in 1593. A city loggia stands near the cathedral, constructed in the 14th or 15th centuries. Over the years, it has had a number of uses, including that of a court. Within the loggia is a relief by Ivan Mestrovic, depicting Petar Berislavic of Trogir. He was a Croatian Ban (viceroy) and Bishop of Zagreb; he died in 1520 in a battle against the Turks. The Cipiko Palaces, opposite the cathedral, were home to the town’s noble family in the 15th century. Full details of the town’s hotels, apartments and private accommodation options are in our Accommodation in Trogir section. The area code is 021. More info at the lovely Trogir Online and the Trogir Tourist Office website.